The garden following the work. A maintenance firm has stepped in to help restore an Arbroath garden trashed by “dimwit” vandals. Former Royal Marine Chic Grant stepped in after Angus Council said it could no longer afford to maintain the flower bed at Infirmary Brae. 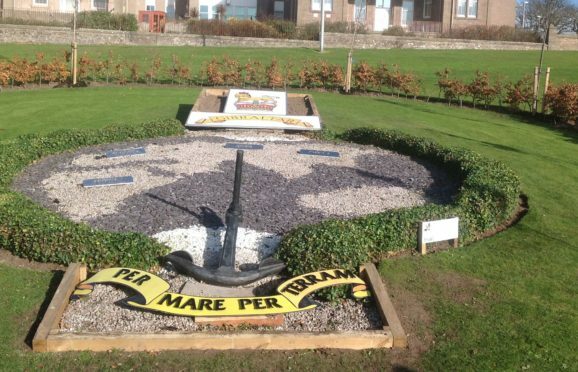 In a four-month operation around four years ago, which saw him move 14 tonnes of earth, Mr Grant, with some grant funding and advice from Angus Council, created a sensational floral tribute to the Royal Marines on the 350th anniversary of the corps, which included the planting of nine Mountain Ash trees. Angus Council leader and Arbroath independent councillor David Fairweather called the incident “disgraceful” and branded those responsible as “dimwits”. The incident came to the attention of specialist grounds maintenance firm Tivoli, who decided to step in and help. Mr Wood pulled together a ten strong task force, and in an all-day exercise, planted Nine Sorbus Mountain Ash trees, donated by Craigmarloch Nursery, in a symbolic four-five formation, in recognition of the close connection between the town and 45 Commando. Perimeter beech hedges were also cut back, and general tidying and repair works carried out. DAB Fabrications contributed a series of metal plaques, each one representing one of the four continents in which 45 Commando operates. The volunteers were kept fuelled during the day by Royal Marine veterans who set up a field kitchen. Mr Grant said: “I’m extremely grateful to Tivoli, and everyone who came along to help today, it’s been a magnificent effort by all concerned. Mr Wood concluded: “We are truly proud to be part of the renovation of this garden, with our employees giving voluntarily of their own time.